One of the truest things I have come to know about motherhood is that the days can feel like years, while the years go by like days. Early motherhood was not easy for me. I started out with no pram, no cot but a homemade sling, a pile of flat cloth nappies I had made myself in bright pink cow print, and oodles of idealism. When told we couldn't be released from hospital unless we had a car seat installed, we said no problem - we were going home with the baby in a sling on the train! It wasn't easy though. I struggled with no sleep and being in the middle of my degree, the frustration of my life being on hold for this tiny, irrational being who inspired such terrifying extremes of emotion. Old ladies would stop me and between reprimanding me for not dressing my child warmly enough, instruct me to "treasure these times, they grow so fast". I would only nod in a sleep-deprived haze and had no idea what they were talking about. When I moved to the western suburbs, I hardly knew anyone. Days would stretch out in seemingly interminable boredom. Then I found Hausfrau and nearby Fels Park. Now the parks throughout the municipality are being upgraded, but many used to be pretty crappy five years ago. Modern Fels Park was always guaranteed to be full and you could perch on the sandpit and have someone to talk to, even if it was nothing more than that banal, ritualistic "And how old is she?" question. I guess "how many times have you lost it so far today?" is a bit personal! So Hausfrau was a refuge for me during those times. 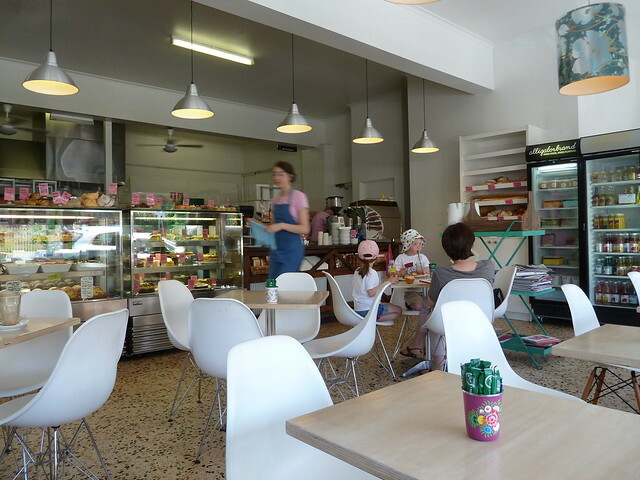 It is grown up enough to feel like you are not totally compromising yourself in the cafe equivalent of a McDonalds playground. 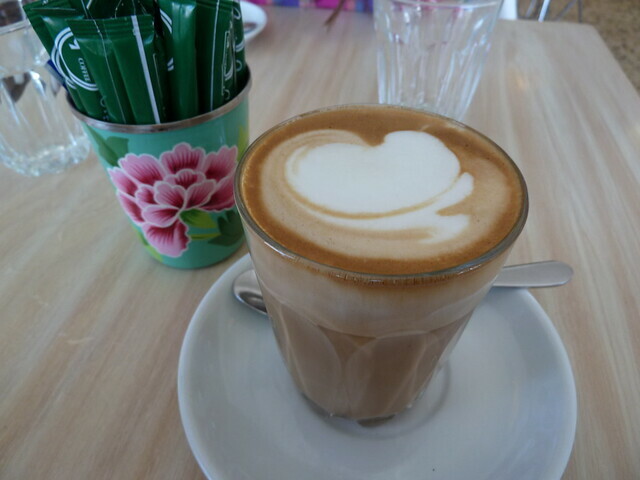 The coffee is old-school Genovese and usually great (the boss, in pink Euro housewife-chic kerchief, makes the best coffee). I love their mini cakes which are perfect, just enough for a child or an adult, especially when you are still wearing threadbare maternity clothes a year later! Hausfrau helped a lot and things got better. My babies turned into curious, delightful toddlers and funny, effervescent preschoolers. 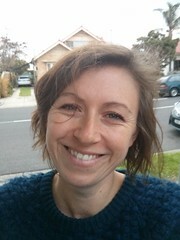 I met wonderful, like-minded people and made an amazing community here in Footscray. My children still frustrate me. I lament the lack of spontaneity, endless sisyphean cleaning and a feeling of moving through molasses, that it takes so long to cook a meal or leave the house. I still complain about stupid things. Then suddenly an incredibly brave friend's baby daughter is diagnosed with leukaemia and everything just seems to fall away in total insignificance. J, it is all so unfair. You are so positive and always have been through everything. When you are ready for a coffee and cake delivery (mini or maxi! ), just call. In the fabric of our wonderful multicultural Melbourne, the South American community may be a less immediately-obvious thread, but it is no less lustrous than others. 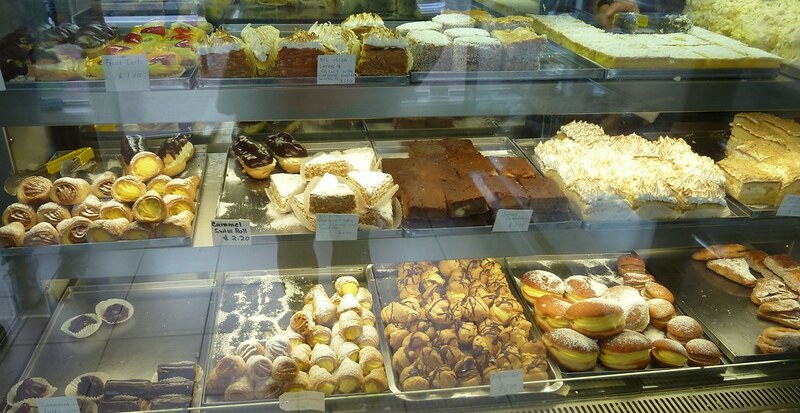 Indeed, the South American bakery in North Sunshine is a real sparkler. 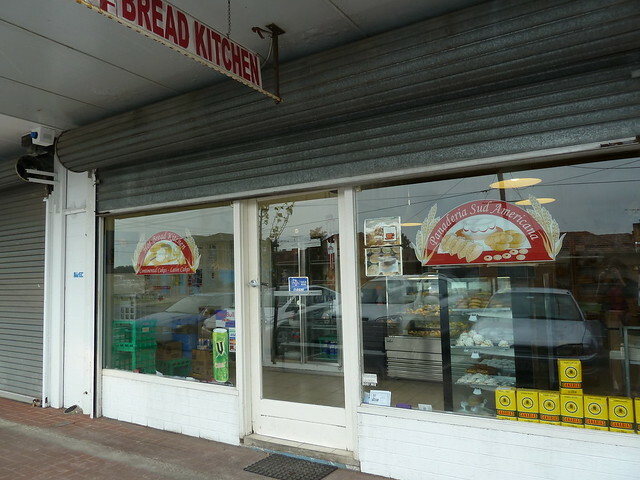 There's something about tiny, tucked-away shopping strips that seems to attract South American places here in the western suburbs. 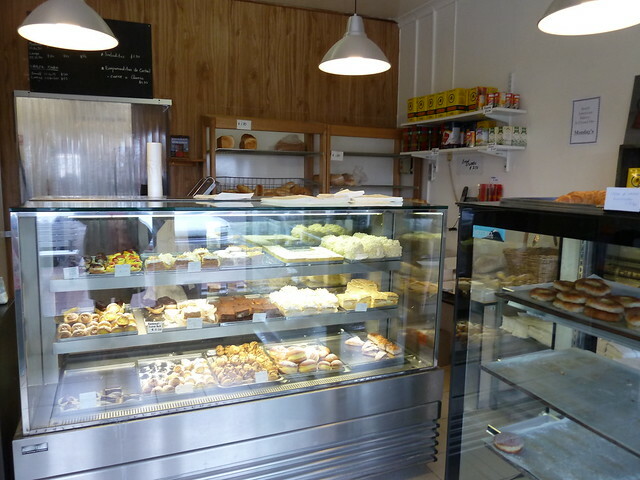 Panaderia Sud Americana is nestled in North Sunshine on a quiet backstreet and fills up with members of the Chilean, Argentinian and neighbouring communities getting their sweet fix. There's a good range of bread that's somewhat reminiscent of French, with stubby baguette-style bread, as well as round, hamburger-like rolls with rustic fork marks on top. 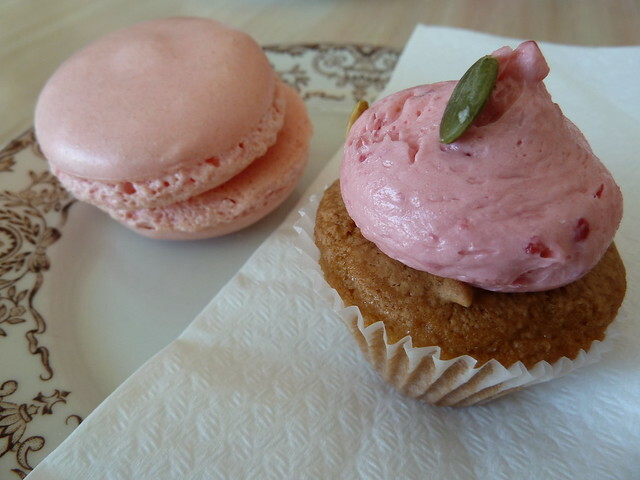 The real drawcard for me, though, are the sweets. They feature lots of pearlescent meringue, whether crisply coating biscuits that in turn sandwich intense caramel sauce or spread gently to enclose huge sponge cakes. A huge part of the pantheon of Chilean sweets is manjar (known in Mexcio as dulce de leche), a home-made, heavenly, thick caramel sauce. Here it comes swirled in tiny homemade donuts, piped into horns and wedged between shortbread biscuits. 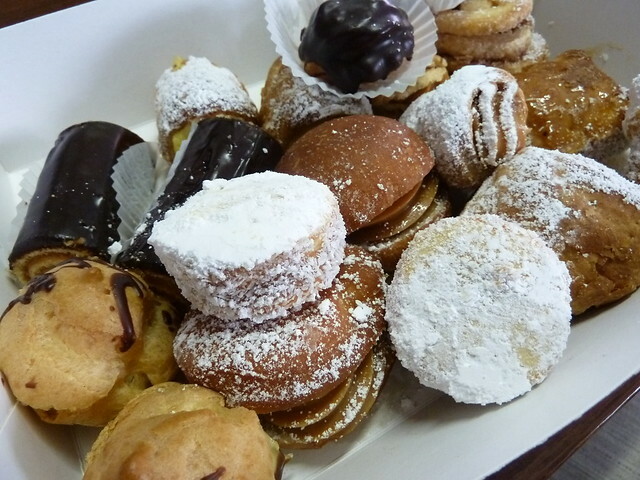 Don't try to snaffle these in the car on the way home - you will be covered in crumbs and icing sugar and it will be a dead giveaway! 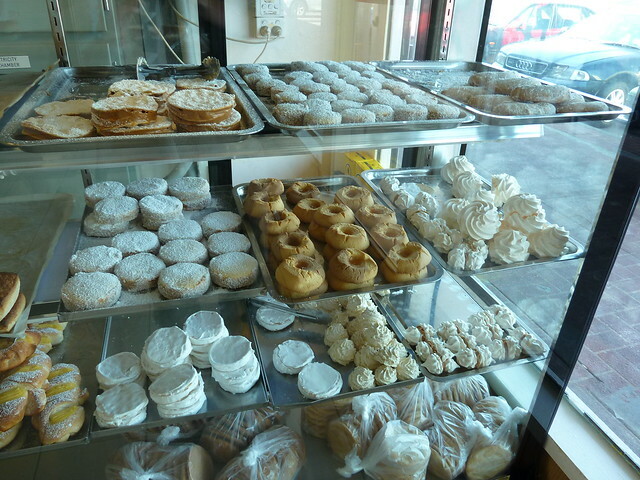 They make all their own pastry here, including puff pastry that features in some seriously impressive mini danishes. Custard features in sweets too, but I prefer the caramel. 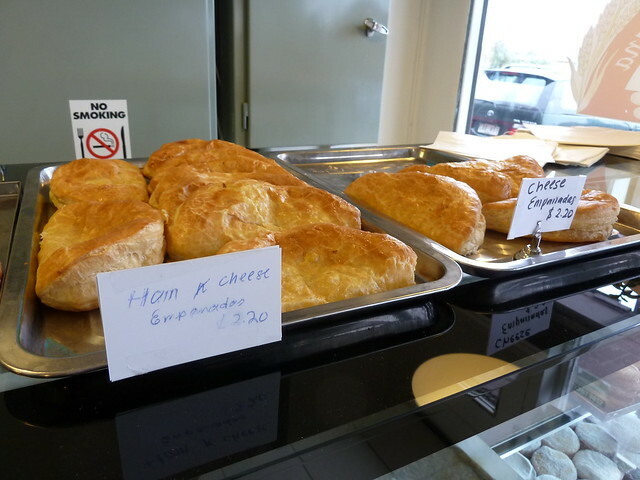 Sweet tooths are not the only lucky ones with a small range of empanadas, pastie-like turnovers filled with cheese and/or ham. Hara hachi bu is a Japanese saying that advises one to eat until "80% full". This mild form of calorie restriction is said to be one of the secrets of the particularly long-lived residents of the Okinawan archipelago in southern Japan. Similarly, there is an Islamic teaching which advises that the best diet is 1/3 food, 1/3 liquid and 1/3 air. Whatever the health benefits, it is also simply pleasurable to eat mindfully, and there's something in particular about Japanese food that just gets you in the zen zone. 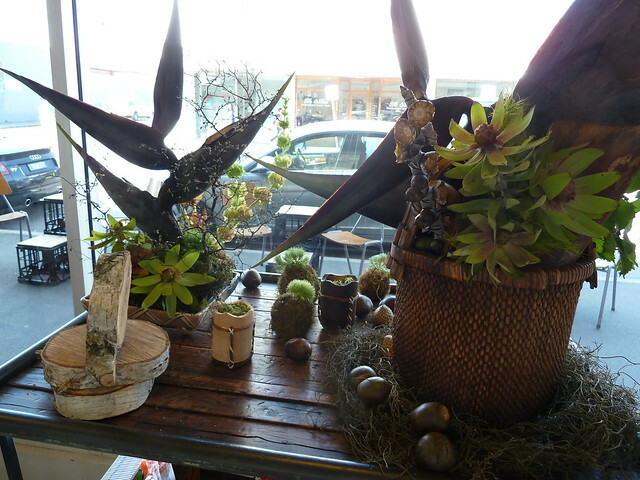 Ajitoya ("secret shop") has just opened in Seddon where the old Mareenie deli used to be and I foresee a rosy future for this bright and bubbly little place. They have a great Facebook page where they share their meals of the day and respond to requests and comments with genuine hospitality and infectious delight. 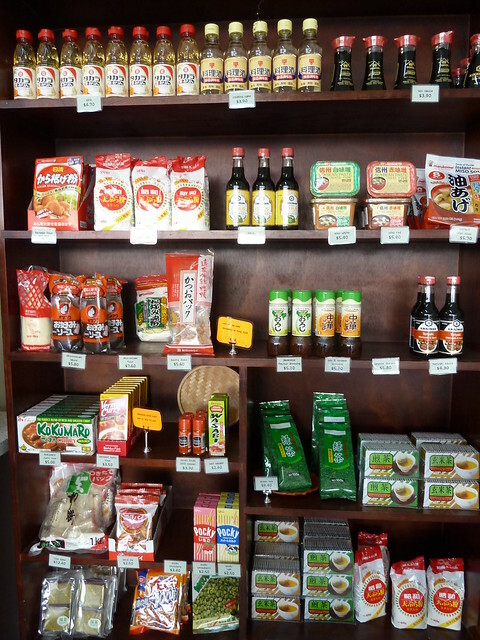 There's also a colourful, well-ordered, tempting Japanese grocery range with sweet little hints for buying and cooking. 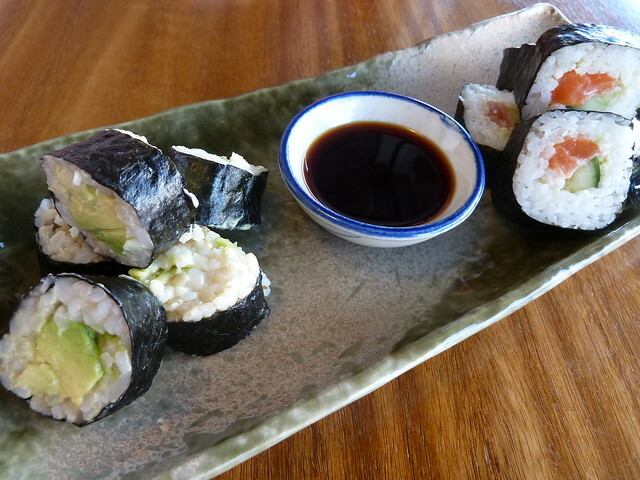 Sushi rolls ($2.80) are unreal, served on gorgeous earthenware. The brown rice avocado rolls on the left were a bit of a revelation - the brown rice was surprisingly soft and faintly nutty, not at all what I would have expected. 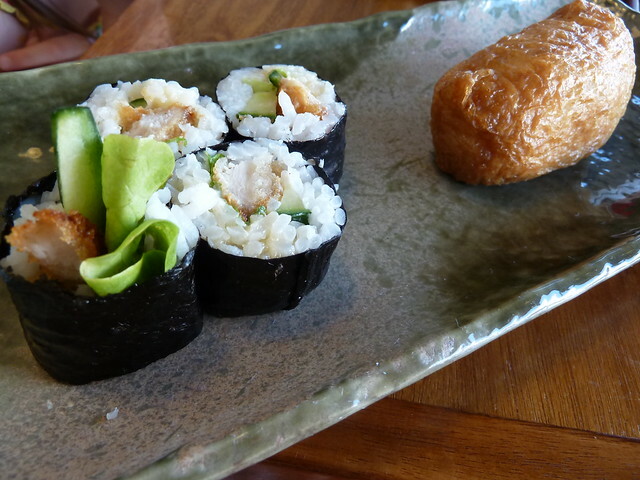 The nori is springy and tender and the salmon spanking fresh, rolled with just a tingle of homemade wasabi. Now, the rolls here are smaller than the ones at Highpoint, but you can't argue with the quality and besides, this way you get to try more flavours! Crispy chicken was good and the inari, sushi rice stuffed into sweet beancurd skin pockets, was a kid hit. 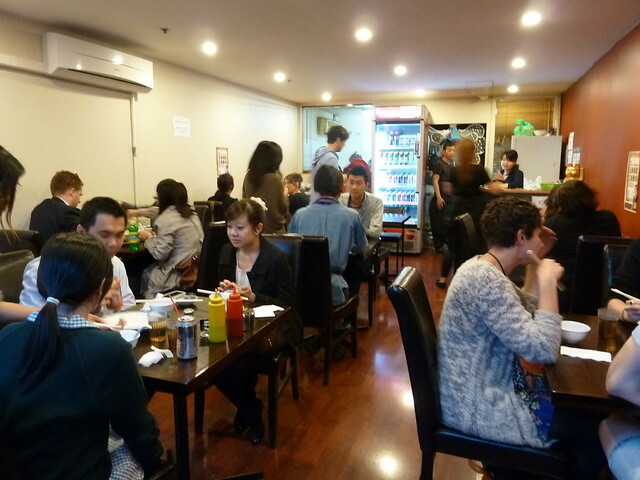 Many of the sit-down meals come as a "set" with your choice of "osozai" deli salads from the cabinet. They are just so pretty, like little rockpools filled with colourful sea creatures. 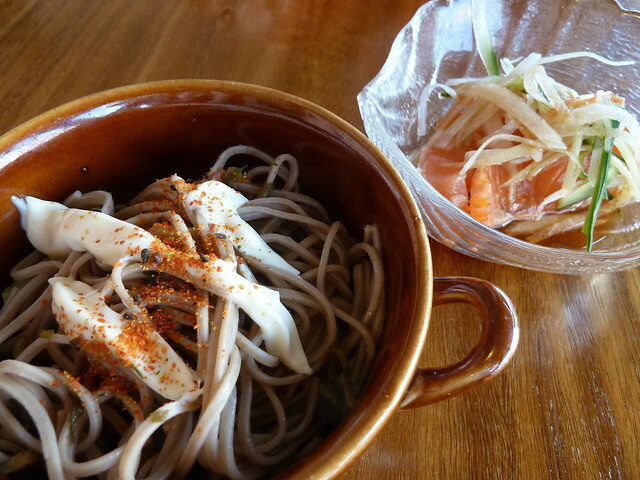 We loved these soba noodles, perfectly al dente with a little vegetable, Japanese mayo and teasing sprinkle of chilli. Salmon tataki was delicious, cooling and centring - sashimi-grade salmon seared momentarily before being accented with sesame and soy. A set comes with your choice of dish (tempura, karaage fried chicken, agedashi tofu and so on), rice, miso and osozai salad. The miso was perfect, little soybean paste swirls billowing up from the bottom of the bowls, concealing tender tofu squares. 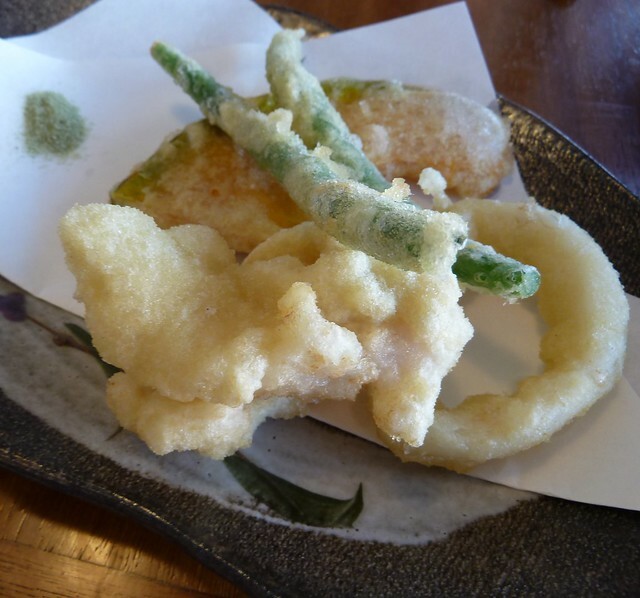 This tempura was excellent. Traditionally it is served on paper as here to demonstrate the chef's skill in making it almost totally non-oily. 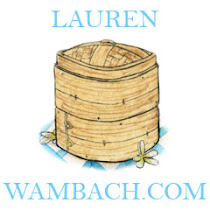 We got super-fresh fish, calamari, long green beans and a delicate wafer of pumpkin. Loved the green dipping salt! 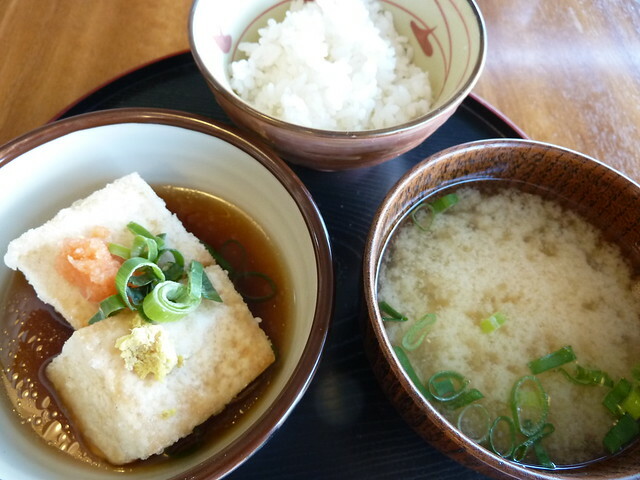 Everything here is very authentic, so it is very possible our so-so verdict on the agedashi tofu was our overseasoned palates craving salt and sugar, rather than a failing of Ajitoya's. The squares of tofu were soft and the seasoning was very mild and subtle. Freshly grated ginger on top lifted the dish. I was feeling the Ajitoya love so very much, I wanted to carry on the Japanese theme at home. 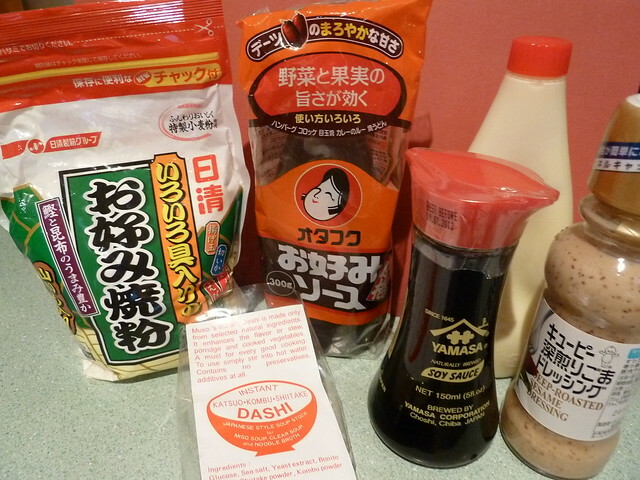 The grocers in Footscray do have Japanese product sections but they only have the standards and you have to watch the use-by dates. At Ajitoya, I found this fantastic specialist flour for okonomiyaki (Japanese pancake), all-natural and seasoned with dried seafood and vegetables. 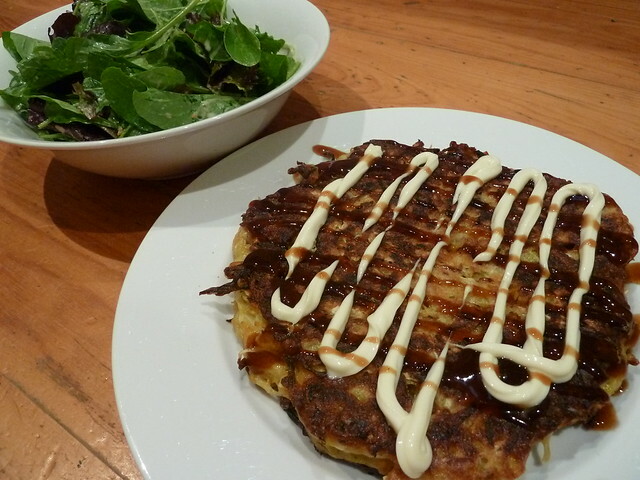 With fruity okonomiyaki BBQ sauce and Kewpie mayo, we had the fixings for a great dinner to match our lovely lunch. Winner dinner - took less than 30 minutes to make, was easy peasy, packed with vegies, kids loved it and it used up the half-head of co-op supplied cabbage that has been languishing in the crisper, accusingly haunting my dreams. If you want the recipe, tell me :) Salad was gorgeous with creamy, sweet sesame dressing, also from Ajitoya. Well, this is yet another day I didn't eat til 80% full, but I sure did enjoy the extra 30%. 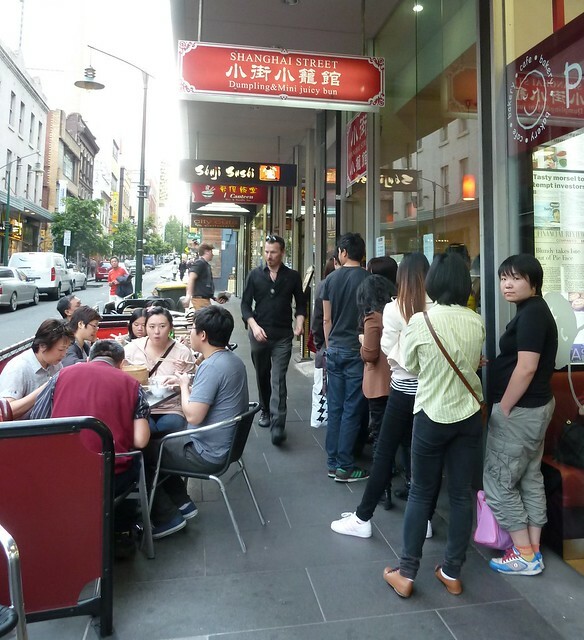 There was an interesting debate on the Melbourne food bloggers' Facebook group recently about queuing for food. More restaurants are now doing a no-reservations policy where it's first in, best dressed. This can create long waits which put people off, but personally I don't mind it. More time to catch up and chat while the anticipation grows... More drinks at the bar! In some ways it's more democratic - everyone has to wait their turn. I do love Hu Tong but have not been there for eons, although not for lack of trying. Spontaneous dumpling cravings lead to me dragging people up there only to be constantly turned away for not booking. Especially as these gorgeous daylight savings evenings just keep rolling in, I am just as happy to join the orderly line at Shanghai Street when the xiao long bao craving strikes. Shanghai Street is a functional shop serving dumplings and "mini juicy buns" that has swooped in to capitalise on the collective swoon Melbourne has for xiao long bao in particular. As Nina Rousseau writes, husband and wife team Min Shi and Wayna Zhu have much experience making dumplings back in Shanghai. You may indeed have to queue but both times I have been, arriving at 6pm meant that we first waited five minutes and the second time walked straight in. 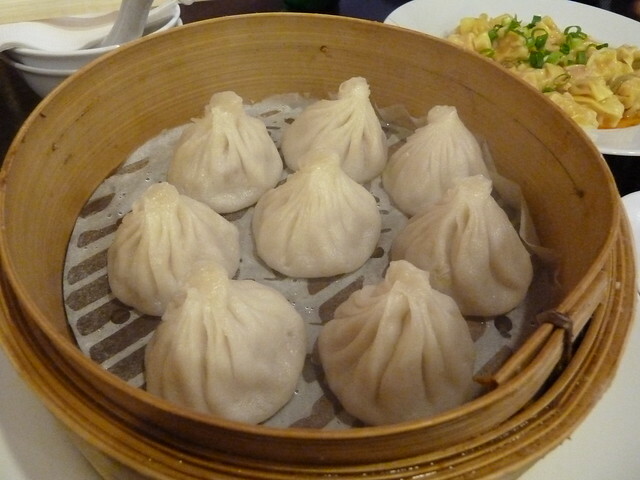 Xiao long bao are a type of steamed dumpling from eastern China. The classic version is made with pork mince with gelatinous meat stock that upon heating melts to create the magical experience of a dumpling filled with hot soup. To eat, place in spoon, pierce with tooth or chopstick and allow the soup to drain out before slurping. OH SO GOOD - it's almost like the stock has been double-cooked, once on its own and secondly upon steaming and melting, it has picked up more intense porky flavour from the filling. The minced filling itself is clean-tasting, gingery, soft and consistently textured. These are really fabulous - hard for me to compare to Hu Tong as it's been so long, but really, really great. 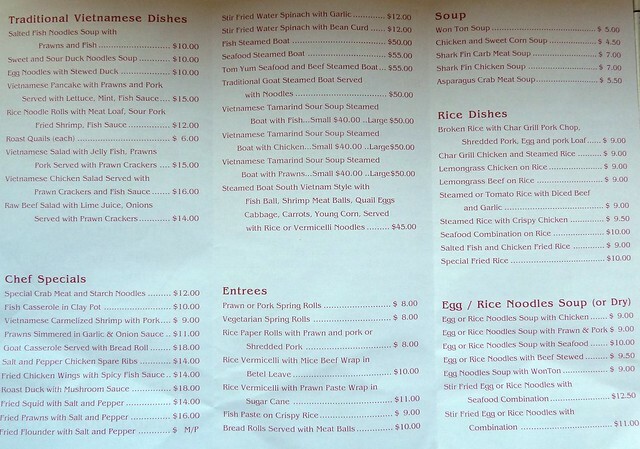 An interesting feature of the menu is xiao long baos of many sorts - crab and pork, chicken and pork, even panfried. These vegetarian ones were interesting - a carefully-made filling of lovingly chopped greens with a little rice vermicelli and occasional umami pops of shiitake mushroom. Normally I only get vegetarian dumplings fried as the nondescript filling needs to be offset by some oily crunch, but these were good steamed. No classic xiao long bao soup but good nonetheless. Sorry no mid-bite shot in which you would have seen the vibrant, emerald-green filling! 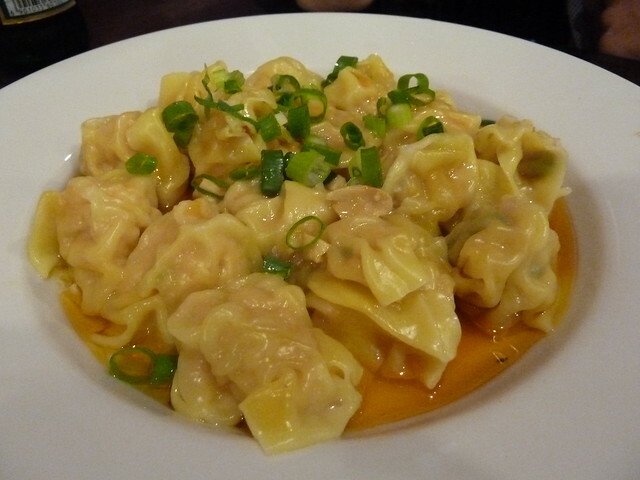 Fantastic pork and prawn wontons. While the xiao long bao filling was pillow soft, here the filling was bouncy yet still juicy with chunks of prawn in slippery, seductive wrappers. They came in a light broth just tinged with chilli oil but with the interesting addition of "sesame butter" (like tahini!) and chopped peanuts. A taste sensation - the springy, juicy prawn with delicate, silky pastry, complemented by dobs of rich, thick sesame paste. Hard to describe but I think an absolute classic. 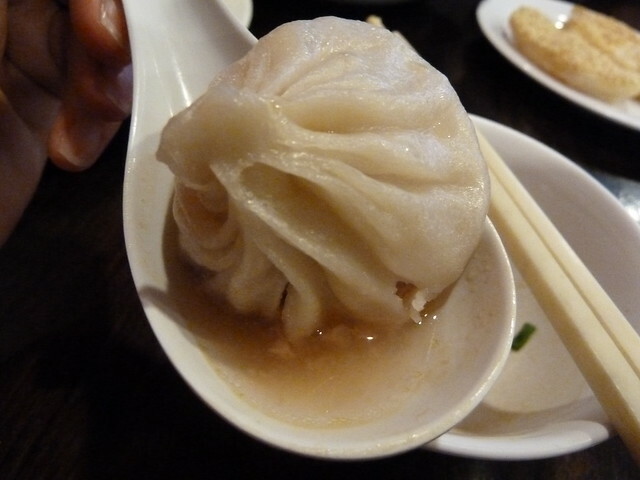 The classic jiao zi dumpling - these can come either boiled or fried. These fried pork examples were pretty good. The filling was honest and of good quality, minced pork with visible ginger and spring onions. The skins were good with appreciably crusty bottoms, perfect dunked in a little black vinegar. 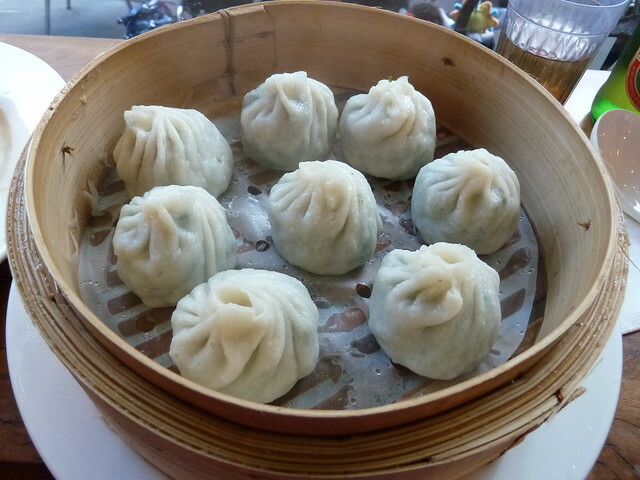 They weren't overly juicy though - I think I might prefer the super-crispy, rich and juicy ones at Dumplings Plus. Oh lordy, these were awesome. 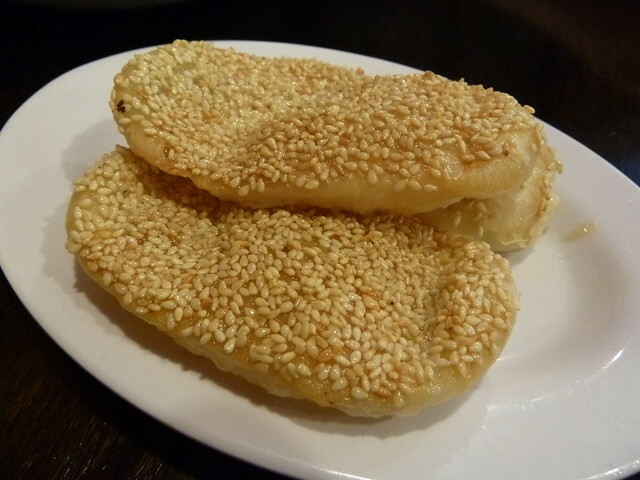 Short, flaky, lardy pastry enclosing little smidgens of bacon and onion, the top rippling with sesame seeds. Delicious!! This place is pretty unreal. You can really taste the freshness, helped by the massive turnover every day. Each filling was unique, each skin texturally different and I was particularly impressed by the care evident in the vegetarian dumplings, which can often just be a cabbagey mush fest. The only drawback to the queue outside is you feel somewhat pressured to eat and leave - I must say never by the staff, who are friendly and professional, but I had a sense of pity for all the hungry people waiting outside. 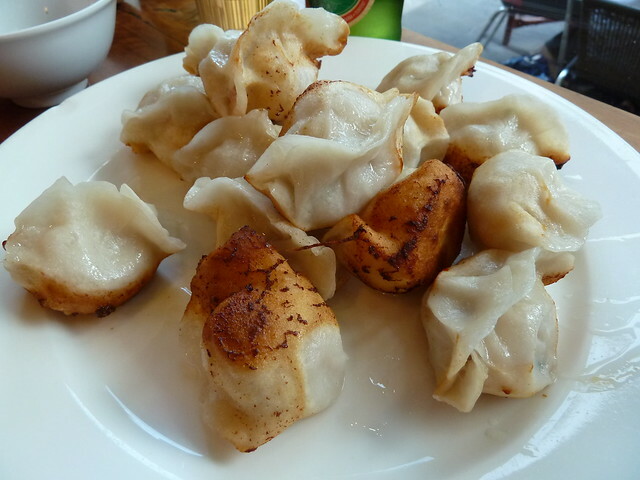 Nevertheless, my advice is to stagger your ordering as between chatting and eating, two plates of dumplings can cool fast and they are much better piping hot. Sorry people in the queue for delaying you further - but as you will find out soon, when it is this good, it's worth waiting for. Thanks Billy and Dan for the original tip (via this post). Dan Kuseta is an all-round lovely, genuine person who has poured his heart and soul into Milk Bar Mag, "an independent guide to the best of Melbourne. Updated daily and covering everything from food to freebies to art to architecture, the Milk Bar is your cultural and creative guide to the city". Check it out! 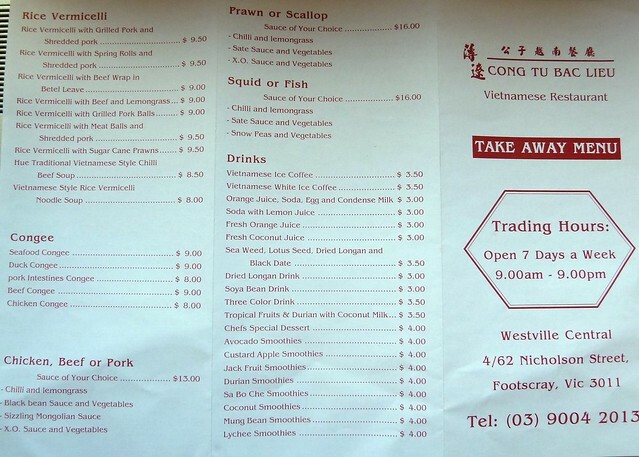 Phong Dinh, specialising in hu tieu mi (rice/egg noodle) dishes, has opened on the seemingly ill-fated site that housed the short-lived Thai and Korean restaurants. Let's hope they have a long and prosperous future there, as the food is really promising. 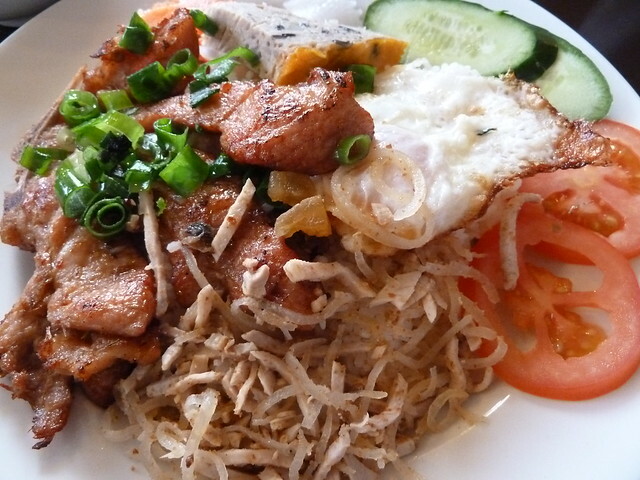 Hu tieu mi literally means "rice/egg noodle" and are a subset of dishes that can be made with either rice or egg noodles (or my favourite, a mixture) with some sort of topping/main ingredient, such as a piece of crispy fried chicken, wontons, prawn and pork, seafood etc. Some hu tieu mi dishes will say "soup/dry". "Soup" means that broth will be ladled on top to make a full bowl of soup whereas dry means the noodles will come as a sort of salad with a small bowl of broth on the side. The prawn and pork hu tieu mi is perhaps the most classic in my opinion and while I love the soup version, a good "dry" (kho) is excellent - as is Phong Dinh's version. Here, a tangle of fabulously textured, pleasantly bitey clear rice and curly egg noodles are tossed with just a little dark sauce (I think dark sweet soy?) 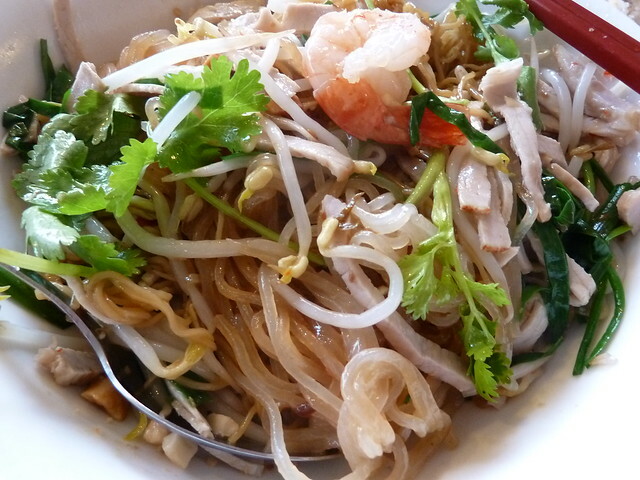 and then topped with good prawns, tasty sliced pork, a quail's egg, bean sprouts and a cracker "lid". This is dressed with just a little judiciously-applied sweet chilli sauce. Add a spoonful or two of their absolutely excellent broth, filled with pork mince, chips of pork fat and spring onion, and mix (Thanks Hung for the tip a long time ago). Slurp slurp, moan... Delicious! 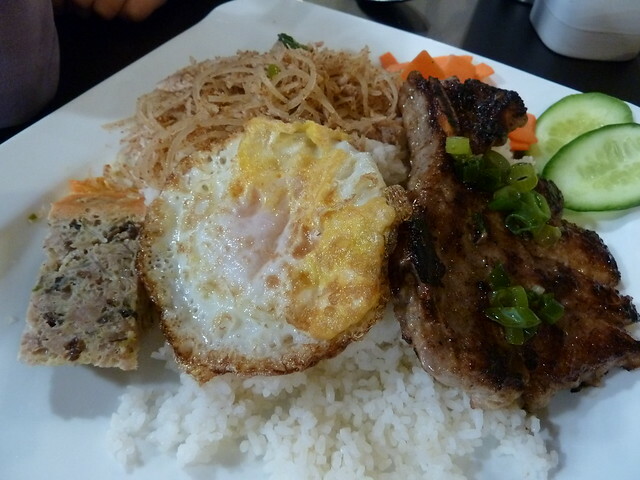 Great com tam - a very generous serve of broken rice (rice once "broken" in two as a by-product of milling but now produced for its own merit, beloved for its different texture to whole rice) with a well-marinated, tasty pork chop, snipped for ease of eating with fork and spoon. The egg was divine with a runny yolk just begging to be popped. Great bi (shredded pork and skin) which I normally do not love, but this was really fresh, very meaty and you could really taste the intriguing, nutty flavour of the roasted rice powder. Lots of vegies, both pickled and fresh, lighten up what can be a meatfest. The only down point of the meal was the seafood coleslaw. These vary wildly in price and had been originally what I wanted for dinner. We couldn't get a spot at Hao Phong, where the coleslaws are all around $10 (looking at old pictures, I think they are smaller serves though). This was $18.50 and didn't really seem like a coleslaw than a mixed pickle with seafood... 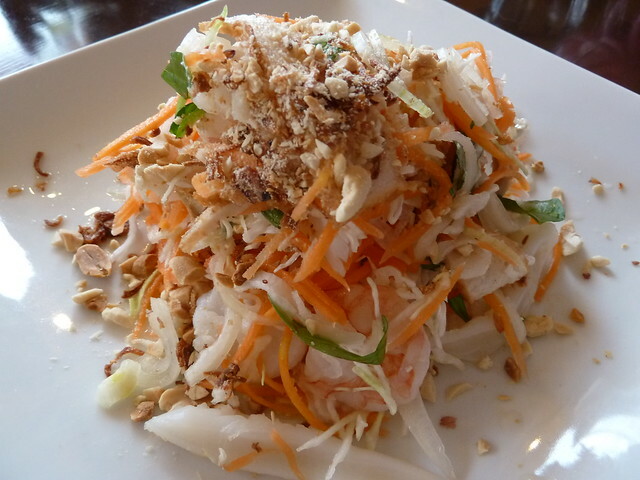 There was well-pickled carrot, daikon and onion, very sweet, with very little contrasting greenery and not enough crunchy shallots or peanuts. Still, the seafood was fresh and we did eat the lot. A very promising new offering to the Hopkins Street scene. 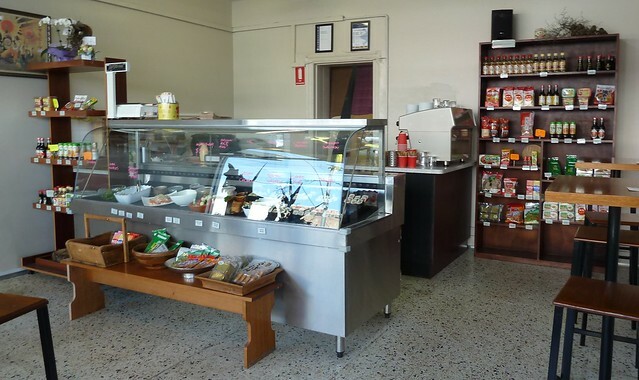 They are licensed which is handy and take cards albeit with some surcharges (none for EFTPOS). 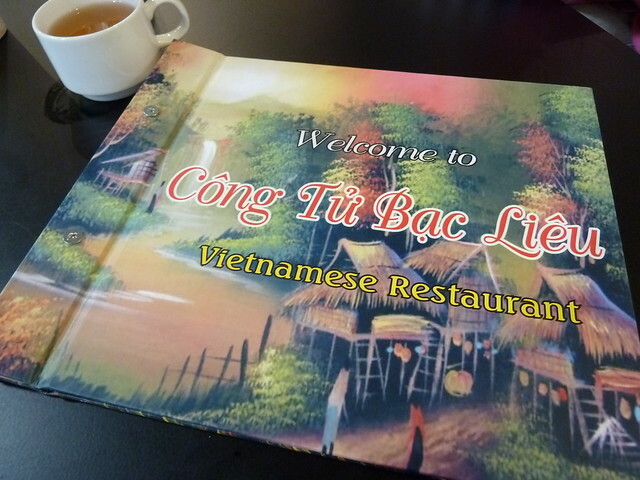 The menu does include all the classics like rice paper rolls, beef in vine leaf etc. 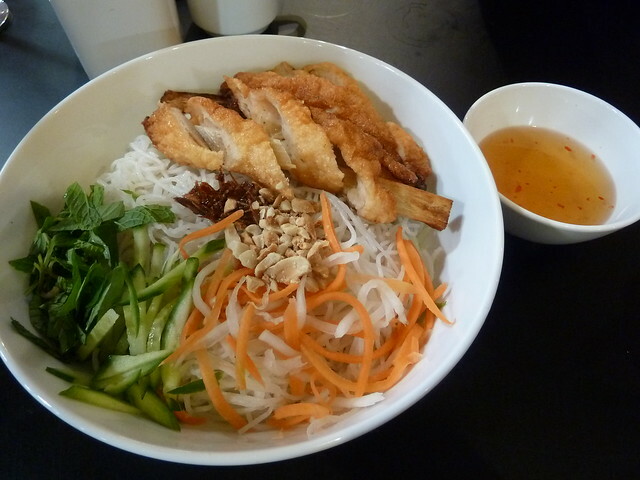 Other menu gems I want to check out are mi siu cao (egg noodles with big prawn dumplings, usually only an off-cart secret of sorts at yum cha), Hanoi-style rice vermicelli soup and some good-looking barramundi in a clean tank, ready for eating with tamarind sauce or ginger and shallots. 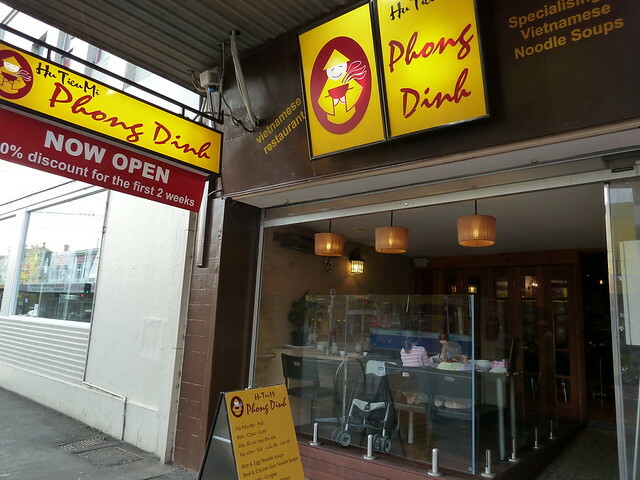 I believe Phong Dinh either have or had an original restaurant in St Albans. I also saw what I think is a second Phu Vinh opening in Sunshine recently. Hu tieu mi shops rock! 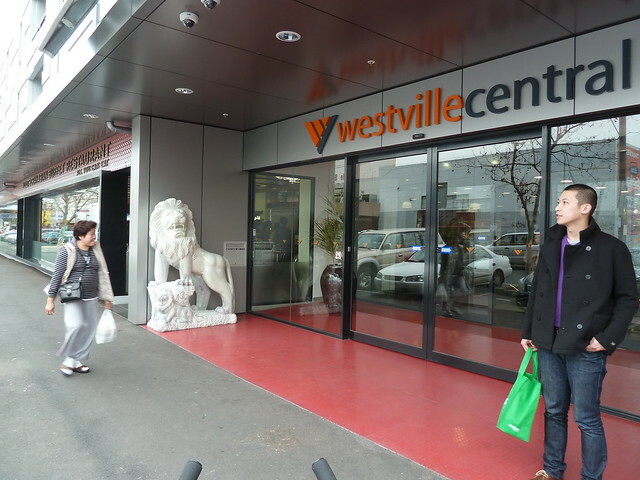 The Westville Central apartment and shopping complex has recently opened up the top of Nicholson Street, giving us lots of new nooks and crannies to investigate. 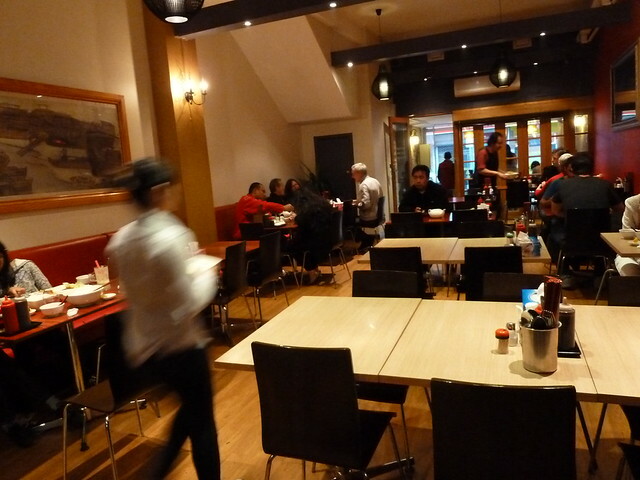 Its flagship store seems to be the expansive (and expensive) Footscray Asian Buffet Restaurant, which in its short lifespan seems to have dramatically plummeting prices as the weeks have gone by. I think it is dear because they have all-you-can-eat seafood but if you don't really want to do nothing but pig out on prawns, the price has made it kind of off limits. They are down to $17.99 for an adult for a weekday lunch, though, so maybe it's worth trying. 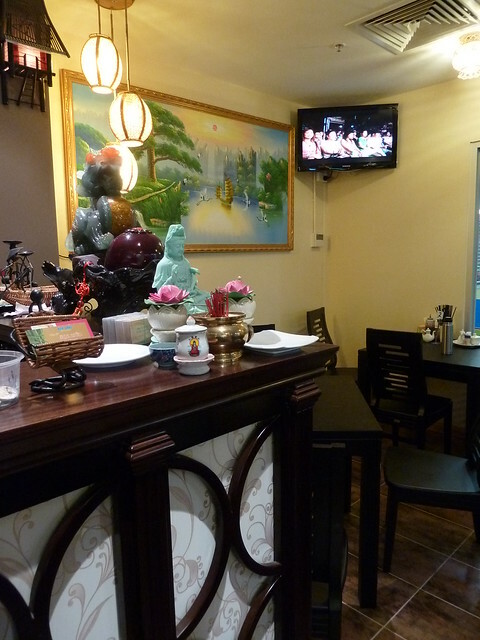 Nha Hang Cong Tu Bac Lieu (or, "the long name place") is a dear little restaurant tucked away inside offering a Southern Vietnamese-influenced menu that punches above its weight. I love the thoughtful decor and the menu is pretty cool too, with quite a few unusual dishes like Cha Ca Chien Com Chay or "fish paste on crispy rice", caramelised shrimp with pork and goat casserole. Sadly a lot of these more unusual things were not available that day - hopefully it was just a recently-opened thing. Pandan tea comes as standard which is a refreshing, floral South Vietnamese touch. A DIY sandwich with meatballs and pickled carrot and daikon. 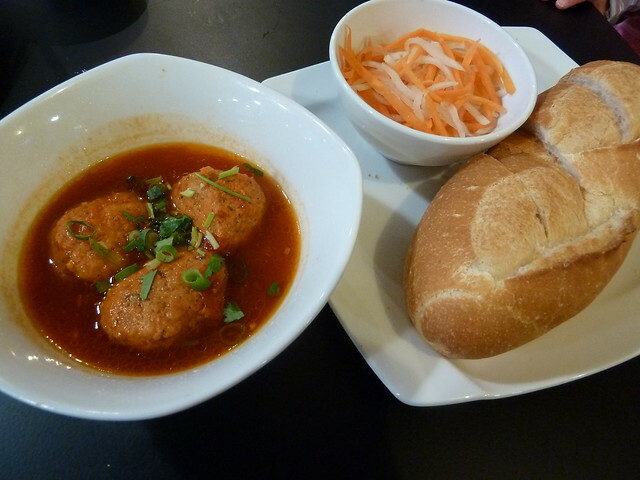 The meatballs were really good, pleasantly fatty and so juicy. They were so soft and tender, it somehow defies physics that they stay together. In hindsight this was probably a bit overpriced when the same thing, un-deconstructed at Nhu Lan is $3.80 but relatively overall it is still cheap. If you haven't gathered by now, I love bun salads. Minus the nuts and depending on what meat you choose, they are virtually fat free. Sugarcane prawns are a kind of prawn/fish paste formed around a sugarcane stalk and grilled/fried. This was a good version - the prawns were not as plump as say, Sen's but still really good. The salad was spanking fresh and I would wager the golden, thready shallots were fried on the premises. This was an excellent version of a classic. The pork chop was really tender and tasty with a not overpoweringly sweet marinade. The "cake" on the left is cha trung and it's a kind of steamed meatloaf made with pork mince, rice vermicelli noodles, black wood ear fungus and then topped with egg. You can see a recipe here (thanks to Wandering Chopsticks). Above is the bi or shredded pork skin with rice powder. This is a great option for kids as there are just a few token vegetables but they get to try a lot of different textures. It came with a delicious bowl of chicken broth. Billy had tweeted somewhat teasingly when he first had this that he had just eaten a Vietnamese dish he had never had before. If you know Billy, that is saying something! 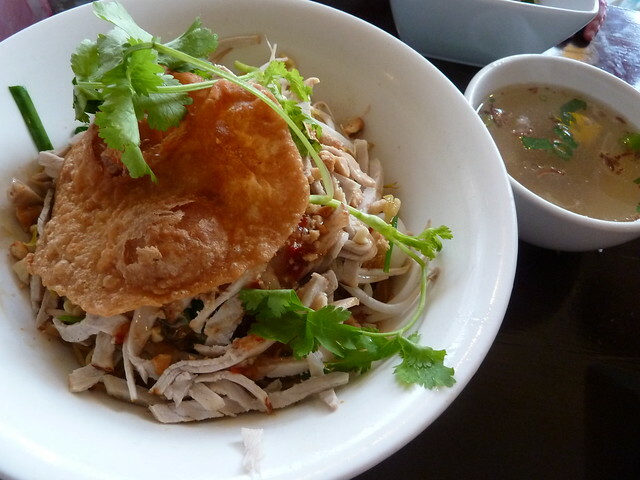 Indeed, these Soc Trang-style noodles are totally new to me too and they are fantastic. Soc Trang is a province deep in the south of Vietnam. Its original Khmer name was Srok Kh'leang meaning "silver depository" as it was the location of the Khmer (old Cambodia) king's silver treasury. 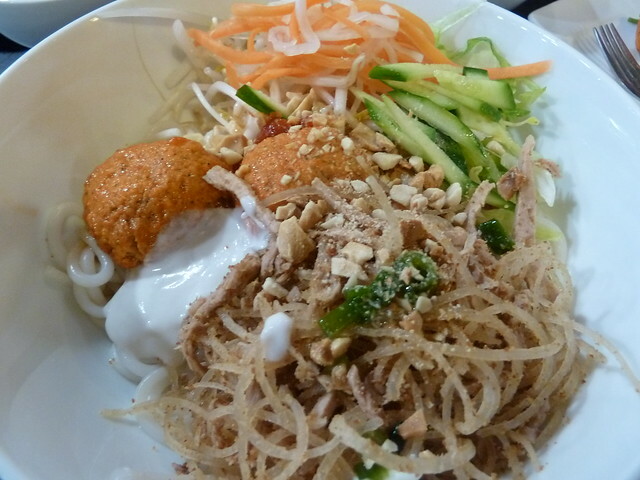 It comprised thick, white, spaghetti-like bun bo Hue noodles, meatballs as featured above, salad, bi and crazy crazy COCONUT CREAM! The coconut coated everything giving it all luscious slipperiness while the tangy tomato of the meatballs shone through. The coconut made it taste slightly Thai which might represent Soc Trang's location in the deep delta. I shared Billy's delight in this unusual and unique regional dish. See here for more info. Interestingly, the Bac Lieu in Cong Tu Bac Lieu's name is a neighbouring province to Soc Trang while Tra Vinh just down Nicholson Street is yet another neighbouring province. I really hope NHCTBL's gaps in the menu are only temporary as it is so refreshing to find regional specialties among the sizzling plates. Meanwhile Westville Central's shops are slowly filling up. 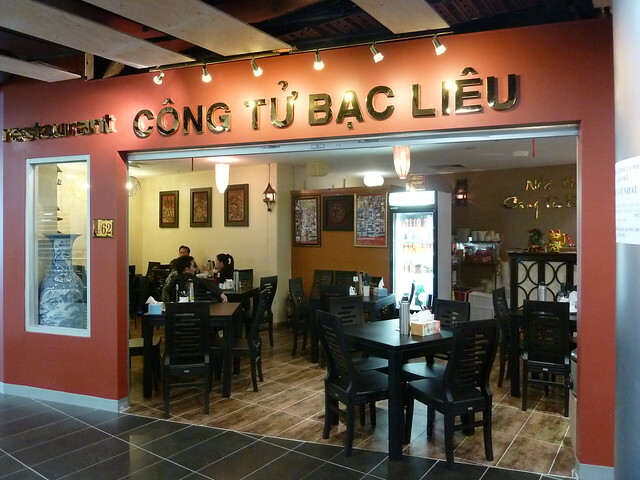 Next to NHCTBL is a bubble tea place that as well as pearl drinks, sells balut (fertilised chicken eggs). Cool!